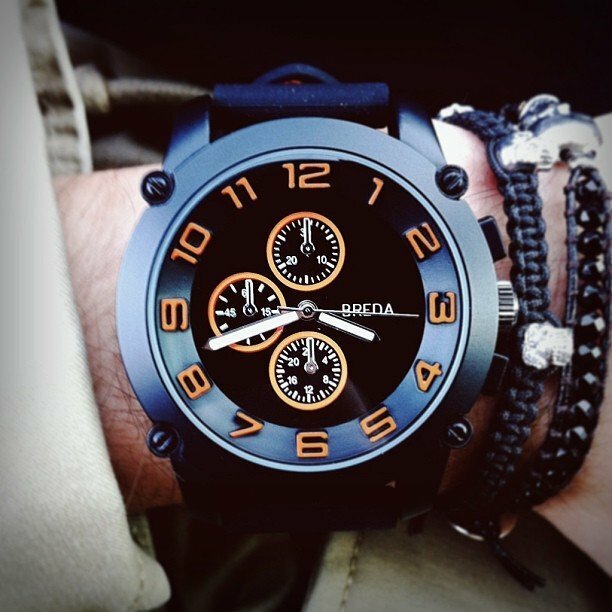 The Breda Men’s “Colton” Black Bezel Black Accented Silicone Band Watch is a sporty watch that makes a powerful statement. The oversized black dial is marked by orange Arabic numerals and has luminescent hour and minute hands with a silver second hand. The dial is protected by a mineral crystal. The three non-working chronograph sub dials add luxury to your look, and the large, bold bezel finishes the adventurous feel of this watch. The watch sits securely on your wrist with a black silicone band and buckle complete with black stitching. It is powered by Japanese quartz and is not suggested for water or shower use.